Allstate – How Could You? Worcester? A stake through the heart. That’s what it felt like yesterday when Allstate published its 10th annual America’s Best Drivers Report and awarded Worcester and Boston, two Massachusetts cities 38 miles apart, with the gold and silver medals, respectively, for most car crashes per capita in the nation. Upon learning of this dubious distinction, local television stations instantly knew that such a story cried out for “man in the street interviews,” and we got plenty of those. Maybe there were people interviewed who were horrified, but most interviewees who made the cut for broadcast seemed to treat it as if it were a badge of honor. Boston drivers are legendary in their demolition derby attitudes. The driving Zeitgeist has forever treated traffic rules as purely advisory. A green light means “go,” and a yellow light means “go like hell.” Pedestrian crosswalks might as well not be there. If you’re riding a bike, you’d better have good radar. So, one learns early on that driving in Boston is not for the faint of heart. And right now it’s at its worst as 152,000 college students return to 35 colleges for the next school year. Thirty-seven thousand live on campus in the heart of the city. Another 50,000 live in apartments around the city. The rest are commuters. The majority of the commuters ride the oldest-in-the-nation transit system. Boston University, alone, has more than 31,000 students. So, I can absolutely understand Boston, a city I love, winning the trophy for 2nd place. But, geez, Worcester? Really? The most dangerous city in the America for car crashes? Worcester’s like a home town to me (so is Boston, by the way, so I’m doubly hurt). Worcester has 181,000 people spread out over about 38 square miles. There are ten colleges in the city, not 35. Students total less than 35,000. Worcester never seems to have the driving hyperactivity one finds in Boston. Although the two cities are connected by the Massachusetts Turnpike umbilical cord, they are like yin and yang. They don’t even have the same water supply. It’s true that Worcester has a lot of traffic lights, so the yellow light “go like hell” possibility exists, but the traffic density is so much less than Boston’s that one rarely sees the Boston mania. Friends from Boston visit Worcester and think they’ve gone to the land of Zen. Right now, you may be asking, “So, where’s the safest place to drive in America?” That, according to the driving gods at Allstate, would be Fort Collins, Colorado, a city of more than 56 square miles with a population nearly 30,000 less than Worcester’s. A city of two, count ’em, two colleges, one a community college, the other Colorado State University. A city with 30,000 college students, and I’m assuming that most of them always wear a smile and speak kindly of everyone. Actually, Fort Collins looks like a beautiful place where everyone rides bikes without a worry and where the average blood pressure is so low that nobody has to worry about getting life insurance. Congratulations, Fort Collins. The question I’m left with is this: How did Worcester, the city of the seven hills, home to the Hanover Insurance Group (and everyone knows that insurance employees are good drivers) earn Allstate’s first place, bottom of the bird cage award? Beats me. I’m stumped and, yes, shocked. My Great Mandala has been poleaxed. I’m going out for a drive. 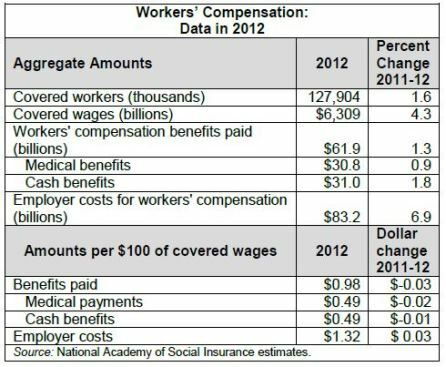 Workers’ compensation benefits rose by 1.3 percent to $61.9 billion in 2012, while employer costs rose by 6.9 percent to $83.2 billion, according to a report released today by the National Academy of Social Insurance. The Academy notes that this reflects the continued economic recovery as employment and earnings rise, and that despite the uptick, program spending as a share of covered payroll remains below historical levels. 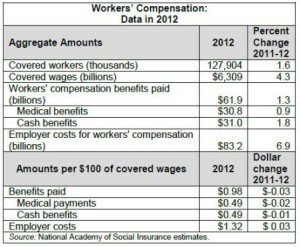 Employers’ costs as a share of covered wages increased by $0.03 in 2012, to $1.32 per $100 of covered wages; benefits paid to injured workers decreased by $0.03, to $0.98 per $100 of covered wages. Are you feeling a little out of touch on your health policy wonkery over the summer? Wondering how things are progressing with ACA and other health policy issues? Catch up on your reading at Health Wonk Review: August Recess Edition. Brad Wright posts a substantive issue at Wright on Health – check it out! Summer reading! Here’s a roundup of links to a variety of recent studies and reports that we find noteworthy – some that haven’t received wide circulation. Nan L. Maxwell and Nathan Wozny of Mathematica Policy Research have issued a study on work-related disability using a previously untapped database — administrative data on claims filed under the Federal Employees’ Compensation Act (FECA) — to show how risk factors underlying disability following a work-related injury differ across groups defined by demographics, employment characteristics, and injury type (that is, injury or illness). Differences exist in three areas: the probability of incurring an injury, the probability of incurring a disability once an injury has occurred, and the size of the association between a risk factor and the probability of incurring a disability. This heterogeneity was previously undetected in narrower data sources and highlights the importance of tailoring efforts to identify and support individuals at – risk of disability to the population of interest. The National Academy of Social Insurance (NASI) and Catalyst for Payment Reform (CPR) issued a comprehensive evaluation of state laws addressing the power of health care providers to negotiate higher prices, cataloging the laws and regulations state governments are using to maintain or increase competition in health care markets, which the recent wave of mergers among hospitals and other consolidation among providers has significantly reduced. See the press release for a summary. “That lack of transparency in health prices partially explains why there is huge variation in what doctors charge for the exact same service. An appendectomy can cost anywhere between $15,000 and $186,000. Doctors don’t usually feel the need to make their prices competitive when shoppers can’t see them. Workers with alcohol use disorders (AUDs) are more likely to have a flat or declining “work trajectory,” reports a study in the July Journal of Occupational and Environmental Medicine, official publication of the American College of Occupational and Environmental Medicine (ACOEM). Journal of Occupational and Environmental Hygiene, Lora A. Cavuotoa* & Maury A. Nussbaumb. In this study, the main and interactive effects of obesity and age on functional performance were assessed during intermittent exertions involving the upper extremity. Monthly Labor Review presents data on the multiple-jobholding rate, or the percentage of individuals who hold more than one job, by state and region. 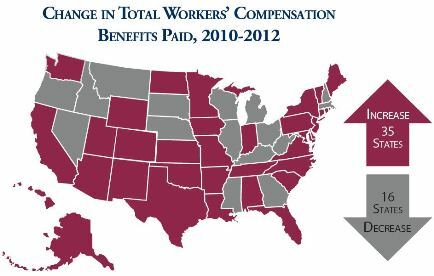 According to preliminary estimates, workers compensation lost-time claim frequency declined by a relatively modest 2% in Accident Year 2013. The Great Recession of 2007-2009, which was the most serious and long lasting economic contraction since the Great Depression, had a considerable effect on claim frequency changes. Frequency increased in Accident Year 2010 and has declined in each subsequent accident year. WCRI has issued eight new state-specific studies identified new predictors of worker outcomes that can help public officials, payors, and health care providers improve the treatment and communication and injured worker receives after and injury – leading to better outcomes. Bill Coffin looks at data and results of Phase 1, covering Indiana, Massachusetts, MIchigan, Minnesota, North Carolina, Pennsylvania, Virginia and Wisconsin. Catching up on our summer reading post vacation, we have a number of pointers to noteworthy news. First we note that according to a recent RIMS survey, the total cost of risk for businesses rose 2% in 2013. To segue on that, we turn to Cavalcade of Risk – a few of our friends have hosted recent issues: See The Italics and Dot-Dot-Dot Edition of the Cavalcade of Risk at Jaan Sidorov’s The Population Health Blog, plus the prior edition Cavalcade of Risk #213 hosted by Jason Shafrin at Healthcare Economist, which kicks off with a great TED video clip on our relationship with fear from Sebastien Foucan. 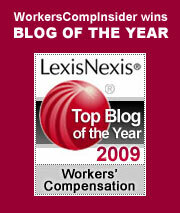 8 revealing WCRI state studies on workers compensation – Bill Coffin of PropertyCasualty360 notes: “The studies measure five specific worker outcomes: recovery of physical health and functioning, return to work, earnings recovery, access to medical care, and satisfaction with medical care. Paying for Detox – At Risk & Insurance, Roberto Ceniceros notes that in response to the opioid crisis, workers comp payers are increasingly turning to detoxification programs and other multidisciplinary treatment modalities to address the problem. He discusses the opportunities and challenges in substance abuse treatment. Obamacare Update: On this topic, we follow Jonathon Cohn’s writings, among others – here are two of this noteworthy recent articles: How Much Is Obamacare Raising Your Insurance Rate? Depends on Which State You Live In and Obamacare’s Impact on the Uninsured, State by State.